By Admin - before i get into this article here follows a disclosure by Admin and another topic revealing the truth about freedom of the press to ponder upon. Firstly - anything written by Admin on this site, is not necessarily the view of IDP. Secondly, Admin or anyone at IDP is NOT anti any race, anti- any nation et al. IDP is simply anti para-site. The truth be said, I am in fact color blind. I have for the last several years lived with a Jewish family that would in fact agree with everything stated herein. I am anti parasite no matter what SUIT the parasite is currently hiding behind. The parasite class that will exposed in the following articles have chosen to hide behind the Jewish religion. Sadly the Jewish people have not ousted this parasite class. Thats nots completely true - some have done so: https://www.youtube.com/watch?v=nMQ9C6vni0w [cf. Real News @ http://RevolutionNews.US — Tens of thousands Jews protesting the State of Israel in NYC... On June 9, 2013, tens of thousands of Orthodox Jews assembled on the streets of New York City to protest against the existence of the State of Israel, and to condemn it's current evil decree to draft yeshiva ]. Critically important info presented herein to understand ZIONIST OWNED GOVERNMENT (ZOG) https://www.youtube.com/watch?v=7ajK3N9A5Ro [cf. Published on Mar 25, 2015 Chris Bollyn interviewed by Gary Richard Arnold dig into 911 and secret societies that constituted many of it's players. Turn of the century individuals played a big part in setting up the Hegelian vortex. Chief Justice Louis Brandeis secret society Parushim. Taft and Daniel Coit Gilman from Skull & Bones and their inter connection flesh out what is unseen by the public. The interview cuts though the emotion and lays out the facts that centers in on the culprits who's institutions and progeny are active today. There is only 20 minutes in part 1 but provides perspective for understanding the may prevent the next False Flag....]. In all its 1,600 pages the three-volume Report does not even mention such a thing as a ‘gas chamber’. It acknowledges that Jews, like many other wartime nationalities, suffered rigours and privations, but’ its complete silence on the subject of’gassings’ is ample refutation of the ‘Holocaust’ legend. https://www.youtube.com/watch?v=CiVSvnPsuaE - Daryl Bradford Smith and Muhammad Rafeeq Oct.2015. https://www.youtube.com/watch?v=TAtVKLATABM 6,000,000 Lies, The Greatest Hoax in history. Lesen Sie dieses Dokument in deutscher Übersetzung! Article from The Barnes Review, Jan./Feb. 2001, pp. 41-45. Few people know the facts about the singular event that helped spark what ultimately became known as World War II - the international Jewish declaration of war on Germany shortly after Adolf Hitler came to power and well before any official German government sanctions or reprisals against Jews were carried out. The March 24, 1933 issue of The Daily Express of London (shown above) described how Jewish leaders, in combination with powerful international Jewish financial interests, had launched a boycott of Germany for the express purpose of crippling her already precarious economy in the hope of bringing down the new Hitler regime. It was only then that Germany struck back in response. Thus, if truth be told, it was the worldwide Jewish leadership - not the Third Reich - that effectively fired the first shot in the Second World War. Prominent New York attorney Samuel Untermyer (above right) was one of the leading agitators in the war against Germany, describing the Jewish campaign as nothing less than a "holy war." Long before the Hitler government began restricting the rights of the German Jews, the leaders of the worldwide Jewish community formally declared war on the "New Germany" at a time when the U.S. government and even the Jewish leaders in Germany were urging caution in dealing with the new Hitler regime. The war by the international Jewish leadership on Germany not only sparked definite reprisals by the German government but also set the stage for a little-known economic and political alliance between the Hitler government and the leaders of the Zionist movement who hoped that the tension between the Germans and the Jews would lead to massive emigration to Palestine. In short, the result was a tactical alliance between the Nazis and the founders of the modern-day state of Israel - a fact that many today would prefer be forgotten. 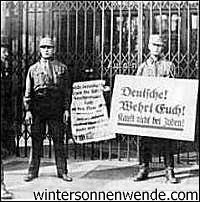 Even Germany's Jewish Central Association, known as the Verein, contested the suggestion (made by some Jewish leaders outside Germany) that the new government was deliberately provoking anti-Jewish uprisings. The Verein issued a statement that "the responsible government authorities [i.e. the Hitler regime] are unaware of the threatening situation," saying, "we do not believe our German fellow citizens will let themselves be carried away into committing excesses against the Jews." 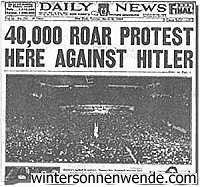 On March 12, 1933 the American Jewish Congress announced a massive protest at Madison Square Gardens for March 27. At that time the commander in chief of the Jewish War Veterans called for an American boycott of German goods. In the meantime, on March 23, 20,000 Jews protested at New York's City Hall as rallies were staged outside the North German Lloyd and Hamburg-American shipping lines and boycotts were mounted against German goods throughout shops and businesses in New York City. The Jewish wholesaler will quit his house, the banker his stock exchange, the merchant his business, and the beggar his humble hut, in order to join the holy war against Hitler's people. The article said "worldwide preparations are being made to organize protest demonstrations," and reported that "the old and reunited nation of Israel gets in formation with new and modern weapons to fight out its age old battle against its persecutors." This truly could be described as "the first shot fired in the Second World War." 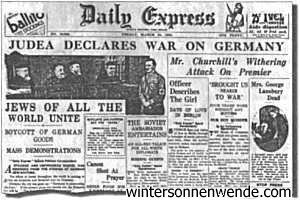 The war against Germany will be waged by all Jewish communities, conferences, congresses... by every individual Jew. Thereby the war against Germany will ideologically enliven and promote our interests, which require that Germany be wholly destroyed. The danger for us Jews lies in the whole German people, in Germany as a whole as well as individually. It must be rendered harmless for all time.... In this war we Jews have to participate, and this with all the strength and might we have at our disposal. In fact, the Zionist faction had every reason to ensure the permanence of National Socialist ideology in Germany. Klaus Polkehn, writing in the Journal of Palestine Studies ("The Secret Contacts: Zionism and Nazi Germany, 1933-1941"; JPS v. 3/4, spring/summer 1976), claims that the moderate attitude of the Zionists was due to their vested interest in seeing the financial victory of National Socialism to force immigration to Palestine. This little-known factor would ultimately come to play a pivotal part in the relationship between Nazi Germany and the Jews. Whereas there was for a short time considerable physical mistreatment of Jews, this phase may be considered virtually terminated.... A stabilization appears to have been reached in the field of personal mistreatment.... I feel hopeful that the situation which has caused such widespread concern throughout this country will soon revert to normal. Despite all this, the leaders of the Jewish community refused to relent. On March 27 there were simultaneous protest rallies at Madison Square Garden, in Chicago, Boston, Philadelphia, Baltimore, Cleveland and 70 other locations. The New York rally was broadcast worldwide. The bottom line is that "the New Germany" was declared to be an enemy of Jewish interests and thus needed to be economically strangled. This was before Hitler decided to boycott Jewish goods. Now that the domestic enemies of the nation have been eliminated by the Volkitself, what we have long been waiting for will not come to pass. Thus, the fact - one conveniently left out of nearly all history on the subject - is that Hitler's March 28, 1933 boycott order was in direct response to the declaration of war on Germany by the worldwide Jewish leadership just four days earlier. Today, Hitler's boycott order is described as a naked act of aggression, yet the full circumstances leading up to his order are seldom described in even the most ponderous and detailed histories of "the Holocaust". The simple fact is that it was organized Jewry as a political entity - and not even the German Jewish community per se - that actually initiated the first shot in the war with Germany. Don't shop at Jewish stores!" Germany's response was a defensive - not an offensive - measure. Were that fact widely known today, it would cast new light on the subsequent events that ultimately led to the world-wide conflagration that followed. To understand Hitler's reaction to the Jewish declaration of war, it is vital to understand the critical state of the German economy at the time. In 1933, the German economy was in a shambles. Some 3 million Germans were on public assistance with a total of 6 million unemployed. Hyper-inflation had destroyed the economic vitality of the German nation. Furthermore, the anti-German propaganda pouring out of the global press strengthened the resolve of Germany's enemies, especially the Poles and their hawkish military high command. The Jewish leaders were not bluffing. The boycott was an act of war not solely in metaphor: it was a means, well crafted, to destroy Germany as a political, social and economic entity. The long term purpose of the Jewish boycott against Germany was to bankrupt her with respect to the reparation payments imposed on Germany after World War I and to keep Germany demilitarized and vulnerable. The boycott, in fact, was quite crippling to Germany. Jewish scholars such as Edwin Black have reported that, in response to the boycott, German exports were cut by 10 percent, and that many were demanding seizing German assets in foreign countries (Edwin Black, The Transfer Agreement - The Untold Story of the Secret Pact between the Third Reich and Jewish Palestine, New York, 1984). ...What we are proposing and have already gone far toward doing, is to prosecute a purely defensive economic boycott that will undermine the Hitler regime and bring the German people to their senses by destroying their export trade on which their very existence depends. Untermyer concluded his largely fantastic and hysterical address by declaring that with the support of "Christian friends... we will drive the last nail in the coffin of bigotry and fanaticism...."
Why did the Germans begin rounding up the Jews and interning them in the concentration camps to begin with? Contrary to popular myth, the Jews remained "free" inside Germany - albeit subject to laws which did restrict certain of their privileges - prior to the outbreak of World War II. Yet, the other little-known fact is that just before the war began, the leadership of the world Jewish community formally declared war on Germany - above and beyond the ongoing six-year-long economic boycott launched by the worldwide Jewish community when the Nazi Party came to power in 1933. We wish to do so in a way entirely consonant with the general scheme of British action, and therefore would place ourselves, in matters big and small, under the coordinating direction of His Majesty's Government. The Jewish Agency is ready to enter into immediate arrangements for utilizing Jewish manpower, technical ability, resources, etc. That his allegations against Germany were made long before even Jewish historians today claim there were any gas chambers or even a plan to "exterminate" the Jews, displays the nature of the propaganda campaign confronting Germany. However, during this same period there were some unusual developments at work: The spring of 1933 also witnessed the beginning of a period of private cooperation between the German government and the Zionist movement in Germany and Palestine (and actually worldwide) to increase the flow of German-Jewish immigrants and capital to Palestine. Dissident Jewish writer Lenni Brennar's Zionism In the Age of the Dictators,published by a small press and not given the publicity it deserves by the so-called "mainstream" media (which is otherwise obsessed with the Holocaust era), was perhaps the first major endeavor in this realm. To the Zionist leaders, Hitler's assumption of power held out the possibility of a flow of immigrants to Palestine. Previously, the majority of German Jews, who identified themselves as Germans, had little sympathy with the Zionist cause of promoting the ingathering of world Jewry to Palestine. But the Zionists saw that only the anti-Semitic Hitler was likely to push the anti-Zionist German Jews into the arms of Zionism. For all the modern-day wailing by worldwide supporters of Israel (not to mention the Israelis themselves) about "the Holocaust", they neglect to mention that making the situation in Germany as uncomfortable for the Jews as possible - in cooperation with German National Socialism - was part of the plan. This was the genesis of the so-called Transfer Agreement, the agreement between Zionist Jews and the National Socialist government to transfer German Jewry to Palestine. According to Jewish historian Walter Laqueur and many others, German Jews were far from convinced that immigration to Palestine was the answer. Furthermore, although the majority of German Jews refused to consider the Zionists as their political leaders, it is clear that Hitler protected and cooperated with the Zionists for the purposes of implementing the final solution: the mass transfer of Jews to the Middle East. Edwin Black, in his massive tome The Transfer Agreement (Macmillan, 1984), stated that although most Jews did not want to flee to Palestine at all, due to the Zionist movement's influence within Nazi Germany a Jew's best chance of getting out of Germany was by emigrating to Palestine. In other words, the Transfer Agreement itself mandated that Jewish capital could only to go Palestine. It served the Zionist interests at the time that Jews be loud in their denunciations of German practices against the Jews to scare them into the Levant, but, on the other hand, Laqueur states that "The Zionists became motivated not to jeopardize the German economy or currency." In other words, the Zionist leadership of the Jewish Diaspora was one of subterfuge and underhandedness, with only the advent of German hostility towards Jewry convincing the world's Jews that immigration was the only escape. On the one hand, the Zionist fathers of Israel wanted loud denunciations of Germany's "cruelties" to the world's Jews while at the same time demanding moderation so that the National Socialist government would remain stable, financially and politically. Thus Zionism boycotted the boycott. For all intents and purposes, the National Socialist government was the best thing to happen to Zionism in its history, for it "proved" to many Jews that Europeans were irredeemably anti-Jewish and that Palestine was the only answer: Zionism came to represent the overwhelming majority of Jews solely by trickery and cooperation with Adolf Hitler.